Injectadeck is a carefully engineered structural marine foam and adhesive that cures hard as wood, quickly and easily repairing soft spots on your boat’s fiberglass deck caused by rot of the underlying core. Injectadeck saves you from having to peel up your deck and replace it – costing thousands of dollars and weeks or months of time. With Injectadeck, your deck can be fixed in a single afternoon – Really! Injectadeck is exactly what it sounds like – you drill a few holes in the deck, inject the two-part product into the holes, and it quickly expands to fill the void left by rot, making your deck strong, solid, and stable once again. It is water-catalytic and becomes more adhesive when it contacts moisture, absorbing wood pulp and adhering to the fiberglass layers. Traditional adhesives (epoxy, etc.) simply cannot do this. Injectadeck requires just a few holes to be drilled and is even known to reverse moisture meter tests by displacing and absorbing moisture inside the deck. Injectadeck is light, waterproof when cured, exhibits no shrinkage over time, and has an antibacterial/antifungal agent to help stop the rot. Injectadeck fills out the soft spots in a boat’s decks, hatches and gunwales quickly and efficiently by filling the void and curing solid. Injectadeck is perfect for rescuing your boat-for-sale or classic keeper – any boat is worth saving with Injectadeck! Background – Injectadeck was created by an aerospace applications engineer who has relied on various structural foams to provide lightweight solutions for Air, Land and Sea applications. 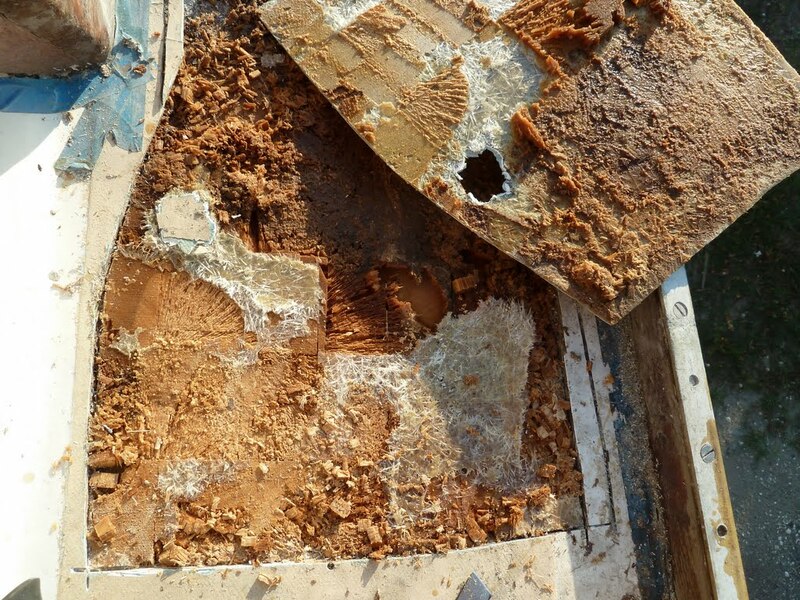 He needed a solution for his aging boat’s rotted deck and, finding that none existed, he set about creating an efficient repair method. Since that humble beginning, thousands of boat owners all over the world have relied on Injectadeck to get more than a few more seasons out of their boat, saving their craft from the dreaded scourge of deck rot. The problem – Once a screw has entered a fiberglass sandwich core, moisture will start to seep in, a little at first, but later it pours in. Gravity and wicking action bring the moisture to the bottom layer of fiberglass. In many boats it forms an entire lake, lowering the vessel’s center of gravity and waterline! Once water collects, the rotting process starts working up from the bottom and, by the time you feel a bad spot, it’s more than halfway rotted through and working its way upward. The Engineering challenge – Since the inception of foam-filled products like boats and surfboards, to modern day aircraft applications, the problem with two-part structural foams has been that they expand quickly and uncontrollably when mixed and require large holes for “the pour”. In addition, they do not address the issue of accumulated moisture, or varying levels of moisture in the deck cavity which also cause the foam hardness to vary. The more water, the more expansion, and hence lower density, making other foams unsuitable. Once cured, Injectadeck is a hard and resilient structural foam (consistency like wood) that can support heavy loads with little or no collapse of the closed-cell waterproof structure. Expanding six to eight times its volume, it’s a dense foam which you could dent…with a hammer. Most boat decks, particularly older ones, are wet rotted and perfect candidates for this product. With Injectadeck’s latest formula and process we are able to adapt to all voids wet and dry resulting in a solid deck you can feel good about. The more water you drain out the harder the foam density. Jim Stubbs Tampa FL “45′ Silverton rotted gunnels, I used a 2″ clear plastic tube on the and run in the gunnels, for my injections, Survey passed!